The Universe is one body, and it is many bodies. It is, at its heart, one – one energy that is constant, unchanging in quantity or essential quality. And it is also many, it comes in myriad forms, it is the many galaxies, the great nebulae and star clusters that are themselves called ‘bodies,’ it is the many planets and oceans and beings that inhabit those oceans, and the beings that, like us humans, carry a piece of the ocean with us wherever we go. Some of the earliest human visions of the universe describe one giant body, split into many. In the Vedas – the ancient scriptures of India – the giant being known as Purusha is dismembered into five parts that become the five directions and the five elements, the basic building blocks of reality. To the Norse people, this cosmic giant was known as Ymir. To the ancient Egyptians, it was Osiris. Whatever the name, the story is the same – one great being split apart becomes the many beings, and the many beings all contain within them the same essence of the one. The gods fashioned the Earth from his flesh, the oceans from his blood, from his hair the trees, from his brains the clouds, from his skull the heavens, and [in the space between his eyebrows] the middle realm in which mankind lives. Embodiment is the defining characteristic of our human existence. We inhabit bodies and we are bodies – our entire experience of the universe and of our selves happens through our own bodies. Indeed, our lifetimes are marked by changes in our bodies, and it is through our bodies that we shape a collection of experiences, perceptions, and impulses into our sense of who we are, why we are here, and why this universe exists at all. Through this individual body, we have a unique set of eyes to perceive the great body, the universe all around us. When we gaze upon the stars whose light comes to us from millions of years ago, or consider the ground beneath us and sense the billion-year story of ancient forests and sea-beds long past, we often feel two things at once: we feel ourselves as distinct beings and we simultaneously feel ourselves as part of a great whole. This union and separation is part of our somatic story just as it is the story of the universe itself. The question of what of this physical form is ‘us’ and what is not ‘us’ is with us right from the start. We begin this somatic journey when two people – our parents – come together as one. We start as one cell and then quickly divide to become two, doubling in size every eight hours in the earlier phases of embryonic development. Those first cells not only form our bodies (what we define as ‘us’) but also form the supportive structures around us that will eventually be discarded, no longer ‘us’ but once integrally part of us. We grow within our mother’s wombs, one with her but also separate. Every bit of matter (note that ‘matter’ comes from the root word ‘mother’) that comprises our bodies until we stop nursing comes from food that she eats and water she drinks. What she feels, we feel. We are part of her, yet we are distinct. We are born in a physical act of separating ourselves from our mothers. We live as distinct beings and, when we die, we return to the earth – ashes to ashes, dust to dust. The separate becomes united once again. Along the journey of this lifetime, we long for wholeness. We long to feel part of the greater universe, part of that great night sky above us and the ground beneath us. We long to feel held by this universe the way we were once held in the waters of our mother’s belly. From the yogic perspective, the purpose of our distinctness as beings is to feel wholeness again – so that we can move beyond the feelings of isolation and separation that this embodied existence can sometimes bring and feel ourselves again as one with the universal body. In fact, the very word yoga means union, wholeness, joining together. This wholeness, this union, has many names in the yogic tradition. It is called samadhi – sameness. It is called kaivalya, oneness or singleness. It is even called nirvana, or extinction – the extinction of the separated individual in the realization of the greater consciousness. Yoga teaches that the body is a vehicle to attain this wholeness. Along this journey to wholeness, the body can be our greatest ally and can also present great challenges for us. Its vulnerabilities can prevent us from feeling anything beyond our immediate woes; for this reason, early Hatha Yoga texts describe sickness as one of the primary obstacles to practice and outline freedom from sickness as a central goal of Hatha Yoga practice. Yet injuries can also be great teachers. Our physical struggles can serve as invitations to let go of limited, isolated perspectives and follow the deeper, greater rhythm of wholeness that exists beyond our control. This paradox of the body – that it at once can be our greatest tool and our greatest obstacle, is fundamental in understanding yoga. The impulses of the body have governed human behavior since human beings first walked the earth, with profoundly mixed result. For people throughout history, the pursuit of material and physical satisfactions has been construed – or misconstrued – as the fundamental purpose of human existence. The old joke ‘he who dies with the most toys wins’ has been an unfortunate guiding principle for much of humanity, and along the way bodies have slain other bodies by the millions, claimed other bodies as property, and mined the riches of this earth-body without thought for the greater balance of the whole. This relentless pursuit of the body’s material satisfaction is seen in the yogic tradition as an imbalance, one that results in sickness and is an impediment to finding wholeness – for no healthy system, be it a single cell or human being or whole society, exists naturally in a state of continual acquisition. In the face of thousands of years of imbalanced, body-driven impulse causing much suffering in the world, some spiritual traditions saw the danger of being too wrapped up in the satisfactions of the body and went to the other extreme, steering people away from the pleasures of the body entirely. Early Hinayana Buddhist texts such as the Patikulamanasikara, or ‘Reflections on Repulsiveness,’ encourage meditation on the body as impure, unappealing, and transitory, and instead urge detachment and dis-identification with the body. “It would seem that this human body is little more than a factory for excrement and pain,” said Nagarjuna, one of the foremost early Buddhist scholars. Other traditions spoke of the body and the material world as illusions to be transcended. According to these traditions, the body’s primal impulses were to be overcome; therefore, practitioners withdrew from the world and refrained from all material pleasures. In some cases, this self-denial was taken to the extreme as practitioners undertook severe austerities – intentionally causing themselves pain by sleeping on nails, holding yoga poses for years at a time, denying themselves food, and sometimes even piercing their flesh with hooks and wires. Of course, viewing the body as solely an obstacle to be transcended can lead us away from wholeness. If oneness is what we seek, then this body is part of the oneness, and surely its experiences are a doorway to that oneness. To deny the body, to detach from it entirely is to close our primary portal to union. The middle way – that the impulses of this body are not to be dwelled upon or addicted to, but neither are we to deny this body, but to celebrate it and use it as a tool in our own search for union – is at the heart of much of the yogic tradition, and this balanced view is the foundation upon which modern yoga is built. Physical yoga as we know it arose with the growth of the Tantric schools of thought around the 7th century CE. Tantra means ‘loom’ and Tantric philosophy offers a united worldview in which all things are woven together in a tapestry of universal sacredness. The body is reflective of the whole universe, and the whole universe is the body of the divine itself, and therefore this body is divine as well. One’s mind is the Wisdom Body of a Buddha, one’s speech is the Beatific Body, one’s form is the Perfect Emanation Body, and the world and its inhabitants are… a mandala inhabited by deities. One should meditate upon the Supreme – the limitless, the unchanging, the cause of all the happiness of the world, dwelling in the sea of one’s own heart. The place for meditation on this Supreme Light is the heart-space, the place of the inverted red lotus bud. It should be known that the heart, that very place that lies one finger below the throat and one finger above the navel, is the great abode of the universe. 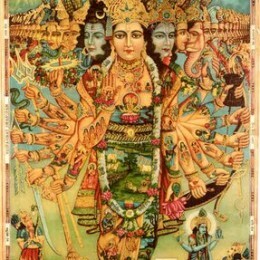 Rather than showing us visions of repulsive beings tormented by the fire of their own greed, the Tantric texts began to show us a very different vision – of a body inhabited by divine and angelic forces that ride on winds of breath, forces that can be nourished and cultivated through practice in service to our journey towards union. The Tantric yogic texts show us that the same essential energies and forces that comprise the body of the universe are alive and active within us: that we are a reflection of the great body, and that sacredness is to be found everywhere in existence. Thus, the ancients pointed to a fundamental sameness between these bodies we inhabit and the divine body of the universe. “We are star-stuff,” said Astronomer Carl Sagan, and it is so. The iron in our blood comes from the furnaces at the center of stars, the salt in our body is the same salt that permeates the oceans. So delicate is the balance of minerals in our being that if our potassium levels change by the slightest of percentages, our entire homeostatic balance is thrown off and our body cannot function. Time and time again, the body exhibits a grandeur and intricate design reflective of the cosmos themselves, woven from the same primordial fire and water and kinetic energy, our bones and muscles spiraling around implied centerlines the same way that vines coil towards sunrays. Though the body exists in a world of ever-fluctuating temperatures, its internal temperature stays almost exactly the same, a remarkable feat that happens through the innate intelligence of every skin and muscle cell and every minute capillary as they become more or less permeable based on external and internal temperature. We are, as the yogic texts tell us, furnaces. In the course of the time it takes to read this essay, you will have generated enough heat to boil a gallon of water. We are burning through this lifetime, and through that heat of this metabolic process, the body is in a constant state of transformation – consuming, assimilating, and reshaping. Yoga awakens our awareness to the inner landscape and connects us to this primal heat, this tapas, harnessing it in service of our transformation. Just as there is a fire to this somatic existence, so there is water. The body is 70% water – certain organs, like the brain, are 80%. Through the delicate chemical gateways of kidney function, the water and mineral levels in our bodies stay precisely balanced. All of the major functions of the body happen in a matrix of water. Nerve cells fire through water, optic signals transmit through water, the bones of the ear vibrate through a pool of water that the water of the brain interprets as sound, and each joint of the body moves in a capsule of water. It is no coincidence that the word for energy channels in yoga – nadis – means ‘streams,’ for we are literally a river-course in which our hearts pump our blood 50 miles per day through a network of capillaries that, were they to be lined up end to end, would wrap around the earth three times! When the ancients said that this body is a universe, they were not simply using metaphor. It is easy to look at the early Tantric view of angelic forces within the body as symbolic, yet we have to look no further than T-cells – graceful and ethereal in form, sublime in function – to see angels. The T-cell takes a meticulous inventory of every single substance it encounters in our bodies – measuring it against an archive of hundreds of thousands of known substances – and makes crucial decisions about what is safe for us and what is not. Guardian angels or ‘just’ little blobs of plasma? You decide. Modern scientific exploration of the body has taught us more about the specific function of this living, breathing organism in the last 100 years than we had discovered in the previous 100,000. Yet yoga, and our combined human experience, reminds us that the body is more than a collection of tubes and valves that can be simply likened to a machine. The body is a mystery and an evolving story. It is the cosmic playing field, where lila, the divine play, the dance of worlds, takes place. It is the cosmic battleground, upon which our struggles and triumphs and tribulations happen daily. The pains and joys of our lives echo through our body tissues like ripples in water; each body has stories to tell and every body has the potential to transform those stories. In the yogic tradition, the practice of calming our consciousness is observed through our bodies, which is why the first steps on the path of yoga all relate to how we use our bodies in this world – what we eat, what we drink, what we say, what we do, how we choose to conduct ourselves sexually, what we keep and what we let go, how intensely we practice, and how well we are able to relax that intensity and surrender to the greater body of rhythms and cycles all around us. In our modern world, we too often treat the body as a neglectful and stressed out boss would treat an employee. We ignore it, then respond to its calls hurriedly by feeding its most basic, addictive impulses. When it feels sluggish, we pump it full of stimulants; when it is anxious, we switch to depressants. We get mad at the body for not looking the way we want it to and so we force ourselves to the gym, often with no other intent than to shape ourselves into something that a retouched magazine cover has told us is the way a body ‘should’ look. This approach to the body is rooted in stress and feelings of separateness; from the yogic perspective, it is a recipe for disease. Lost in this treatment of the body is the recognition of the wisdom and intelligence of the body itself – that bodies have a deeper rhythm of health connected to the living intelligence of the universe. The body is inviting us to that place of conscious embodiment; it is asking us to deeply feel what it is to be human. “I sing the body electric!” exclaimed Walt Whitman, in a great invitation for all of us to find the exuberance in our own somatic experience. This somatic exploration of aliveness, if we accept the invitation, can serve as a precious portal to universal oneness. I read this article and found it very interesting, thought it might be something for you. The article is called The Cosmic Body: An Introduction and is located at http://taptamarg.com/the-cosmic-body-an-introduction/.